George Thompson tells the following story in his book "Faded Footprints" (pg, 133) which could be referring to the mine above. "If you look closely, you might see an old mine on the west side of the canyon just before the old road which used to follow the Yellowstone River leaves Indian land to enter the national forest. 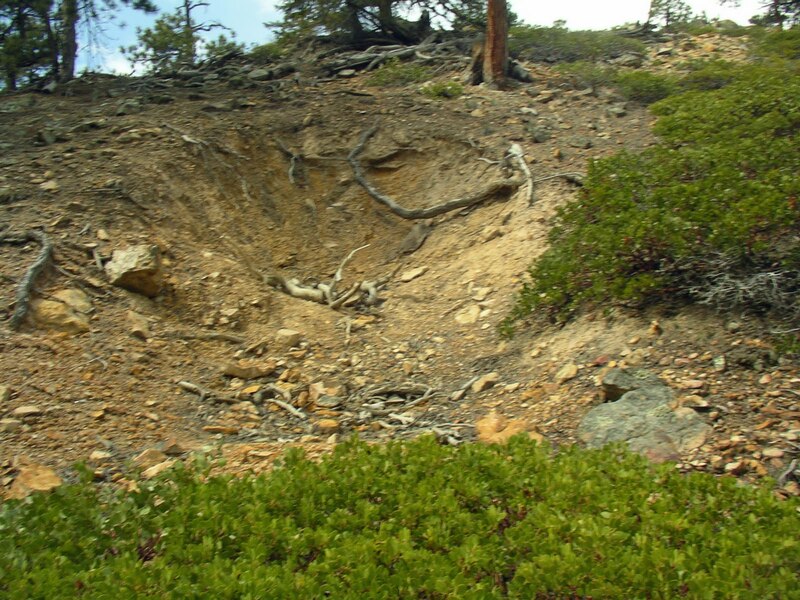 It is often difficult to see when summer growth covers the mountain, for its opening was covered with stones and grassy top soil a long time ago. Just beyond that mine are the Yellow Ledges, shown on most forest maps. Recently some tests were made on surface ore which came from those Yellow Ledges, which revealed that there is a lot of silver there. 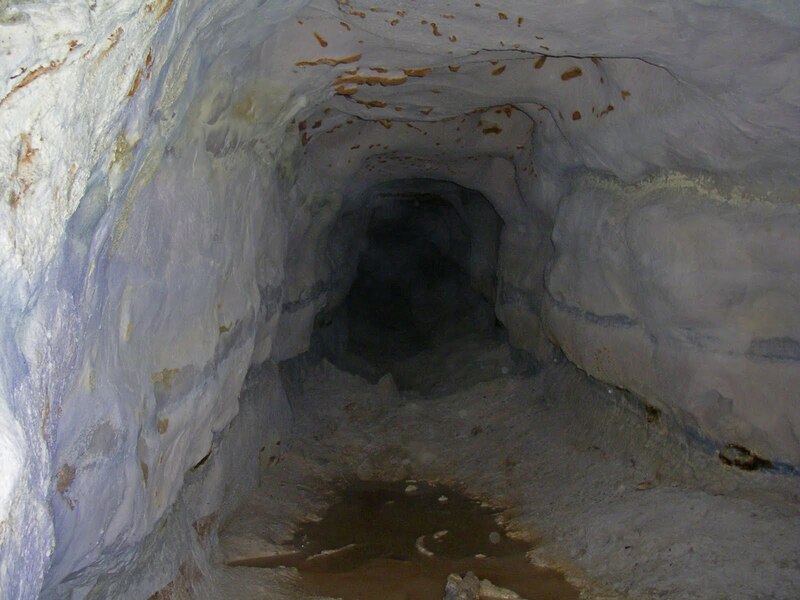 One of the clues Caleb Rhoads mentioned was that one of his mines was located close to some yellow ledges. That ledge area along the Yellowstone is peculiar, which places which are barren, where nothing grows. An engineer may have learned why that is, for he tested water from springs below those ledges and discovered they have a Ph factor of 2.8, which he says accounts for the sterility of the soil and rock. A PH factor of 7 represents a neutral condition, while 2.8 indicates that water is highly acidic, a condition no doubt caused by those spring waters percolating through ore beds somewhere below the surface; according to that engineer, probably close to the surface. It is noteworthy that those springs are located right where the eastern end of the Hoyt Peak Fault breaks the surface." 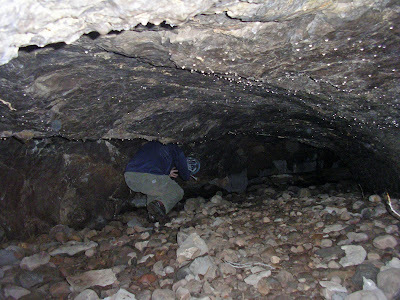 The mine is covered with rocks and logs to make it appear caved or filled in. Below the first layer of rock and debris there is a tarp and another layer of logs underneath to keep the entrance accessible. Looking toward the back of the mine. There are two different passages that are only 25' - 30' long each. George again tells of another mine close by the one mentioned above in his book "Faded Footprints" (pg, 133). "There is still another Spanish diggings in sight of those Yellow Ledges, but lower on the slope and nearer the river. It is more difficult to find, for some years back the Ute Tribe had the tunnel and waste dump leveled off, but if you climb atop the low ridge which runs between the present road and the river, you can see where it was located. Before it was leveled, there was a large tunnel there, big enough that horse drawn carettas could be taken into it. A wide vein of low grade ore can still be seen about a half-mile before entering forest lands, just after a cattle guard is crossed. That low-grade ore was carried to the river on carettas, where it was concentrated. You can still see where rock from that mine was dumped into and along the river. There is a story that some bars of silver are still buried near that mill site. There are a few old-timers in the Altamont area who say that a Forest Ranger recovered two of those bars. One of the Ute tribal council warned him not to go back there, and he didn't. There is a giant yellow pine which stands alone on an open flat near the river and not far from that mine by the Yellow Ledges. Carved deeply into its bark is a large Catholic cross. That tree isn't hard to find, for it is the only large pine on that flat, but it may not stand much longer, for it is so old that many of its branches are dying. That mine may be almost as old as the tree. Some who fish along the river near that old pine have encountered "Susie," an old Indian woman who packs baskets of heavy yellow sand from the mountain front near the old mine. Those who have watched her closely say that she carries that dirt to the river, where she washes it in an old dish pan. They say she makes beautiful things from the gold she recovers from her crude panning operation. Some believe it may be hazardous to their health to search for Spanish mines on Indian ground. 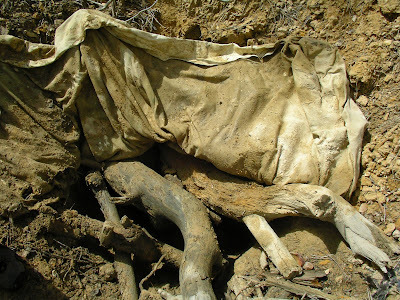 During the 1989 deer hunt, not far from that giant yellow pine with the ancient Catholic cross and the old mine covered with rocks, a hunter from California came upon a shallow grave. 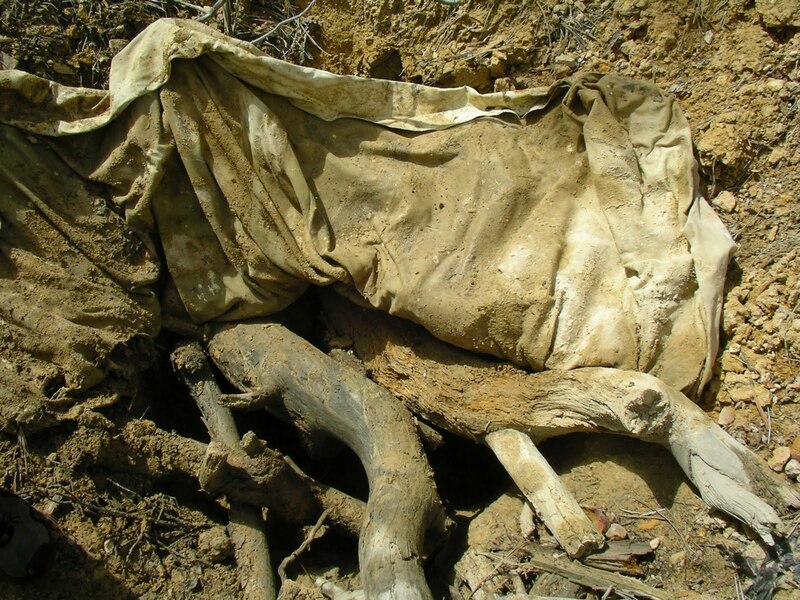 Wild animals had dug into it, exposing part of a human leg and a hand and forearm. The remains were not old and appeared to be those of a young white male. 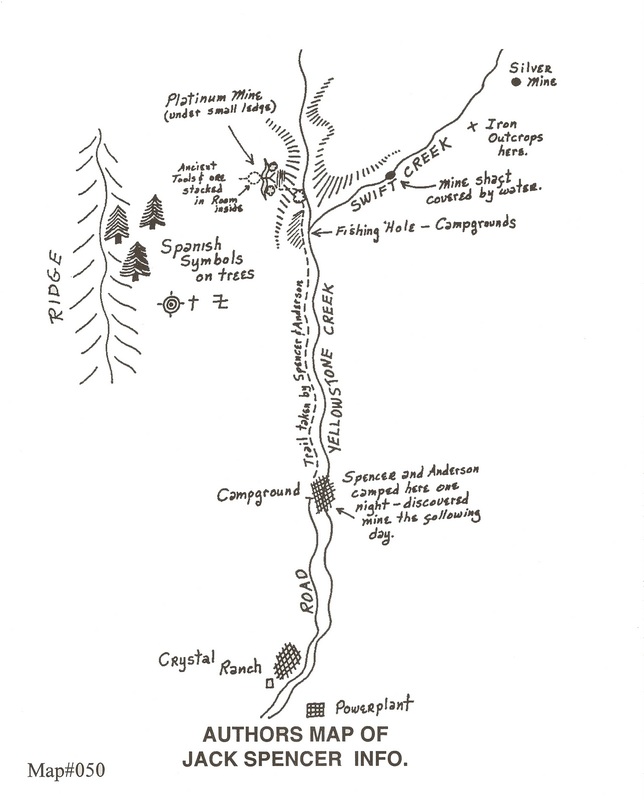 That gruesome find was made at Mud Springs Draw, almost in sight of the old mine along the Yellowstone. Not wanting to become involved in a long drawn-out investigation which would ruin his hunting trip, the hunter waited until after his return to California before notifying the Duchesne County Sheriff's Office by telephone. A search was made but to no avail, since fresh snow had fallen in the mountains. That report could have been written off as a hoax, but it wasn't." Gale Rhoades relates the following story of a flooded mine along Yellowstone river in his book "Lost Gold of the Uintah" (pg, 124). "During the early summer of this year (1987) another important discovery was made on the banks of Yellowstone Creek south of Swift Creek. This discovery was made by Greg and Mike Lowe of Colorado while following old Spanish mine and treasure symbols in that area. According to Greg Lowe, "a series of Spanish symbols" led them directly to the mine. "It's right near Yellowstone Creek and it's flooded -- half full of water -- due to several old beaver dams which have been constructed there forcing the waste water to back up and flood the mine. There's an old spring above the mine which had, at one time, been diverted by the construction of a small ditch. It's a long ditch and must have taken a lot of time and work for those who built it. I doubt if the mine would have flooded if it weren't for those beaver dams. Still, you can see back into the mine a long way, the top of the mine is not flooded. Someone, in more recent times, had done some digging around the entrance of the mine. "I was talking to an old sheepherder in the area and he said that not too many years ago someone else had found the old mine and that, at that time, there was an old door at the mine entrance which could not be opened. The man left and a short time later returned at night with a backhoe, apparently without permission of the Forest Service, ripped the door away from the mine entrance, and found it flooded. The old sheepherder said that after that incident he never saw the man again." Could this be the flooded mine? It is south of Swift Creek and right next to the river. The tunnel was flooded only 20- 30 ft. back. This appears to be a natural cave and there are no apparent signs of mining. Perhaps we need to keep searching for the lost "flooded mine". 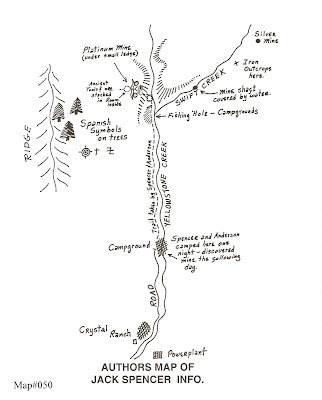 Gale Rhoades published this map he made based on the story that Jack Spencer told him of his discovery near Swift Creek in his book "Lost Gold of the Uintah". "Lee Anderson and I found an old mine near the junction of Swift Creek and the Yellowstone years ago-we were just kids then; I was 10 or 11 years old at the time. Anyway, we were out of school that day and we were just riding our horses up the Yellowstone (River) having fun, like kids do, and we made camp near an irrigation ditch, or stream, near the Chrystal Ranch, near the power plant there. I remember that we rode on up the Yellowstone to an area where people used to camp and fish, and where Swift Creek dumped into the Yellowstone. There we hiked up the mountain a short way and came to a small clearing. "Just on the other side of the clearing, near a hill, there appeared to be a small hole-we thought it might be some wild animal's den at first, but after we dug some of the dirt away (it had partially caved in, or the hillside had slid down over it) we could see that it was a small room-like mine. I remember that there were a lot of wild roses growing there and in front of the small ledge. We had to dig some of them away, too, but once we got in the mine we found a lot of stuff. There were a lot of old horse shoes and a home made pick laying around, and the rock inside was white, with black running through it. The black part of the rock would spark when we scraped it, something like the sparks of a grinding wheel. It wasn't gold. To tell the truth I'm not sure what it was! "We picked up a bunch of the rock and carried it out; most of it we layed by a tree trunk and then went off playing again, but when we came back for it, it was gone. We couldn't find any of it. There was a truck and camper in the area from California, and we think maybe he found the rock and took it with him. But Lee had a piece of it in his pocket which we brought back with us, and which was discarded behind our house in an old bucket. "Dad (Jack Spencer) was over on Rock Creek prospecting a little and helping his friends dig in the "Wild Bull" mine. This was a mine, or prospect hole, which dad, Clarence Johnson, Charlie Arge and two other fellows were working, and he was quite interested in it. They had been writing to a woman in Canada (who had written to them telling them where to dig, how deep to dig and in what direction to dig) who told them that if they followed her directions, they'd hit it rich. They were told that they would first hit a hard section and then the rich ore. They did hit the hard section but did not hit any ore. After that they dug in all directions. "Anyway, days later, when dad got home and found the white and black rock in the old bucket, he asked us where it came from. We tried several times that summer and also the next summer to find it, but could not. And, I guess that rock was pretty valuable." Gale Rhoades tells the following in his book "Lost Gold of the Uintah". 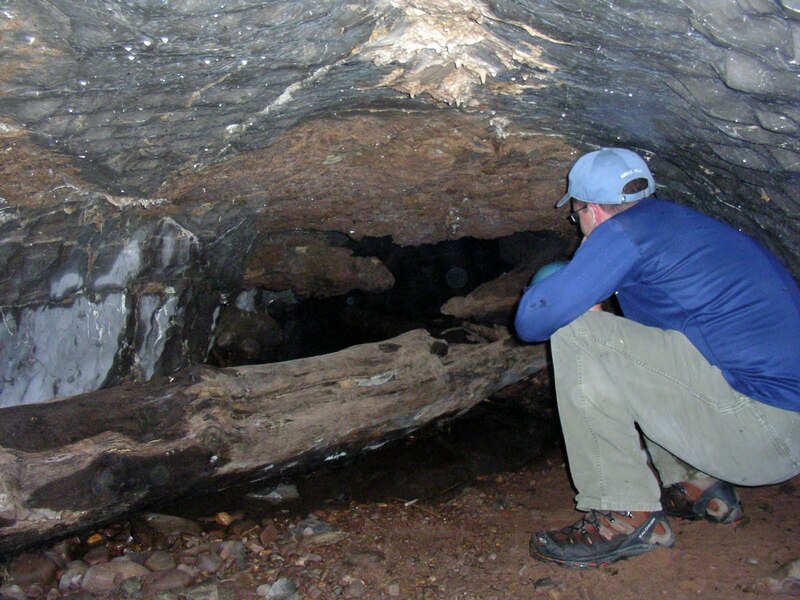 "To the east of Yellowstone Creek there is a small canyon called Lime Kiln Hollow, so named because of the kiln-like structures located near the mouth of the hollow. There are conflicting arguments as to whether these ancient rock structures were actually built by the early settlers for producing lime from the nearby limestone deposits or by the Spaniards for the smeltering of their gold ore deposits. Certainly, both by design and appearance, they have all the earmarks of Spanish smelters which have been found elsewhere in the Uintahs and some fine looking gold and silver slag has been recovered from their floors. On the other hand, history neglects to reveal any large scale operations by the early settlers to obtain lime from that region. This area is covered with symbols, and this one looked to be the most authentic. One of the old smelters in this area. Another smelter close to the other. Yellowstone Canyon has a lot of hidden holes and caves within its walls to be explored. This one is close to the main road up the canyon and near the flooded mine if you are up for an adventure.